The use of implantable electronic cardiovascular devices (IECDs) is rapidly increasing, with approximately 51,274 and 85,289 European patients per year receiving a cardiac resynchronization therapy device or implantable cardioverter defibrillator, resp. Remote follow-up of these patients is finding its way into routine clinical practice. To do so, patients receive a vendor-specific transmission device, which collects data from the IECD during sleep. These data are subsequently transmitted to the device clinic. 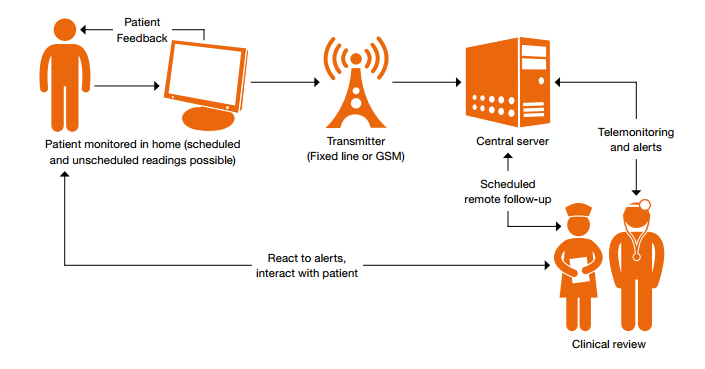 Remote monitoring technology allows for automatic and regular data transfer from the cardiac device, via radio frequency, to an amplifier box at the patient’s home. This amplifier in turn sends the data over a wireless network or telephone line to a central server of the technology supplier. The doctor can consult the data by logging onto a secured Web service from the supplier. Reference: Moving towards good practice in the reimbursement of CIED telemonitoring. A study conducted in five European countries: Germany, Italy, Spain, the Netherlands and the UK. In 2010, Hospital East-Limburg and Jessa Hospital started with a remote follow-up program of patients with an IECD. Dedicated nurses, trained in electrophysiology and heart failure pathophysiology, review all incoming alerts on week days. A systematic and standardized approach is used with interventions triggered by protocol-based, guideline-recommended care and minimal involvement of physicians. 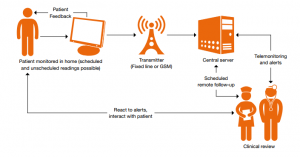 In total, more than 1100 patients are currently in active remote monitoring follow-up. Scientific research on this topic is focused on documenting all incoming alerts and triggered actions in order to further optimize the current process.